This week in my Friday Food Review series I want to tell you about Kopitiam by Wilai. There has been much written on this amazing restaurant already, but I love to share when I find a place that has food so wonderful. Located in Old Phuket Town on Thalang Road, Kopitiam by Wilai is one of the many reasons to visit this area, along with the Chinese temples, art galleries, fabric shops, and Chinese medicine sellers that surround it. For me it is the only reason, as delicious food is the thing that drives my day, but a walk around the neighborhood is quite enjoyable and a great way to work up an appetite or burn off the calories you just ingested depending on when you go. We have enjoyed this restaurant on many occasions now, and each time the food is fresh, delicious, and presented beautifully. Not only that but the staff all speaks english well and you can make special requests (such as no MSG, exactly how many chili’s you want in your dish, etc.). My goal is to try everything on the menu (good thing we will be here at least a year in between our travels! 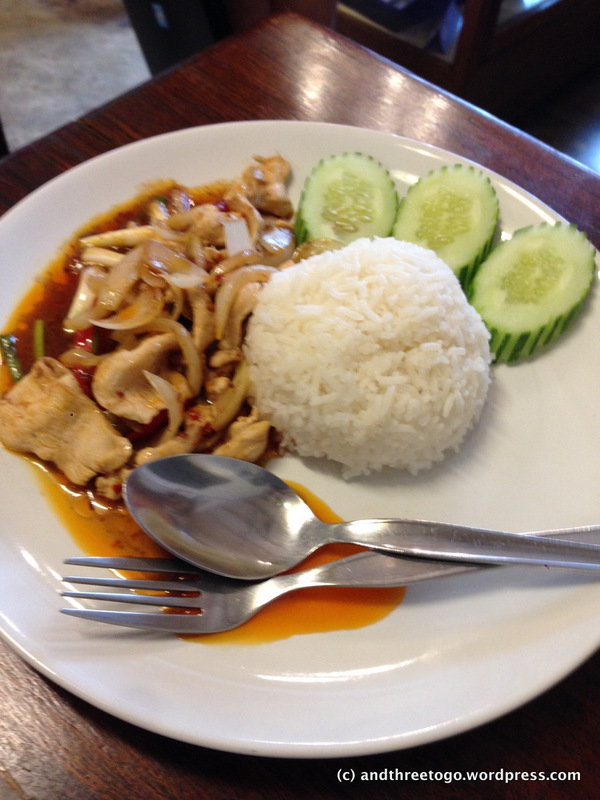 ), it is quite extensive and has a good choice of Chinese, Western, and Thai dishes. Much of what we have tried so far has had a sort of Chinese-Thai fusion flair that ignites the taste buds. Also, the prices are fairly inexpensive, most meals fall between 70-120 baht a piece. I just want to share what we ordered last time, because I do not have a favorite dish yet, everything has been excellent and I cannot choose between them. 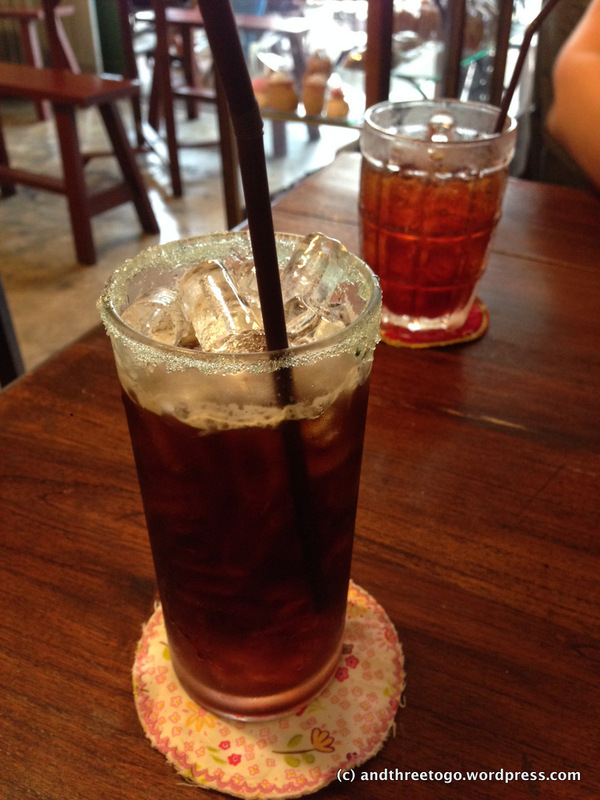 A strong Americano in a blue sugar rimmed glass and a iced tea. We always start with the Phuket salsa in wontons for an appetizer. Chad and I always begin our lunches at Kopitiam discussing what we think this tangy, sweet, and spicy salsa is made with. We are not boring people who have nothing else to talk about, it is just that the salsa is that good. We know it is made with chunks of jicama, thin slices of jalapeno, fresh diced tomatoes, and sauce that is almost kimchi like, maybe vinegar, chili sauce, and sugar. The wonton cups are perfectly fried and crisp. 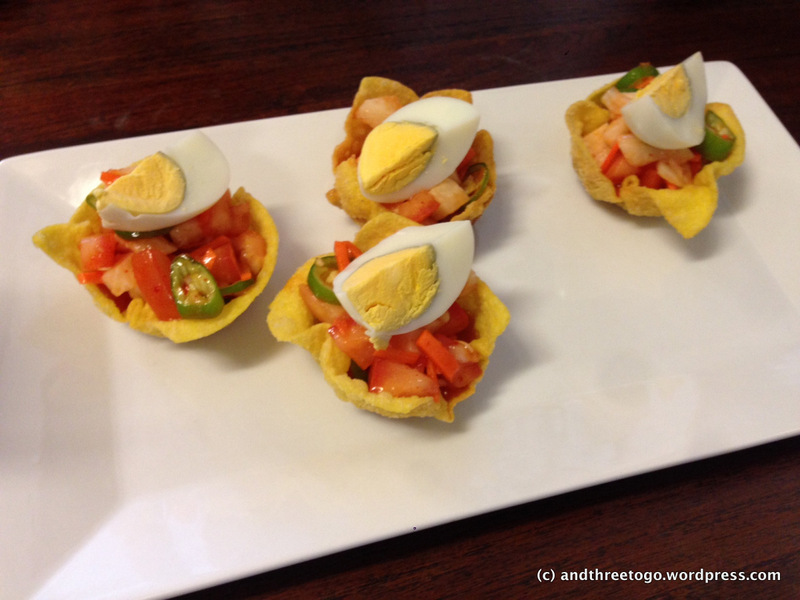 The hard-boiled egg on the top is the perfect accompaniment to the flavor of the salsa. I always end up washing my hands after gulping these down so quickly that the sauce gets all over. The mess is worth it! I ordered the chicken stir-fry with sweet chili sauce and jasmine rice. I always order my food medium spicy, but you can take it all the way to local Thai spicy if you like. The chicken was chicken breast only (rare to find in Phuket) and was a little dry but the softened stir-fried onions and chili’s made up for that. It was excellent and I would order it again. Chad ordered the Moo Hong, which is stewed pork belly and mushrooms in a soy based sauce. 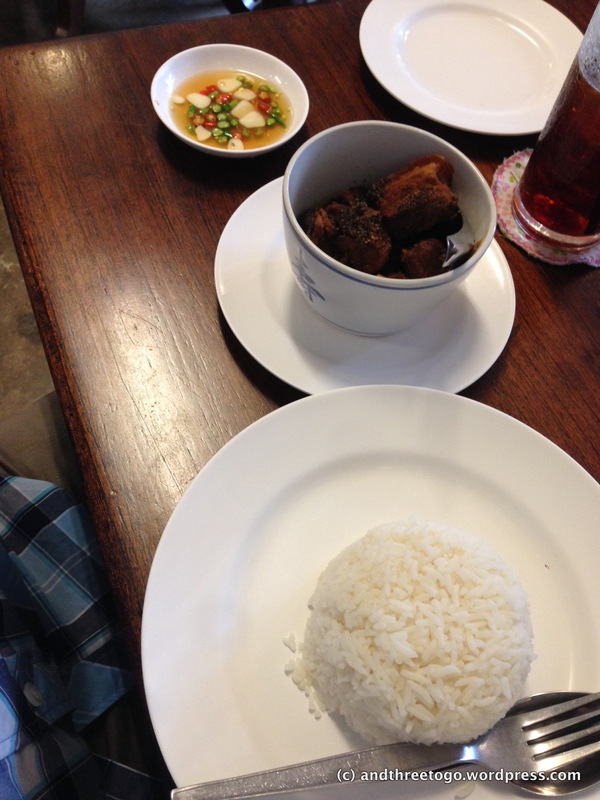 The pork was stewed to a tenderness that it could easily be cut with a spoon. The flavor was more Chinese than Thai and smoky and salty. I love pork in general, but pork belly is my favorite, it’s more fatty but the meat is usually chock full of flavor. At first, when Chad’s Moo Hong was delivered to our table, I thought that the portion seemed a bit small, but the owners obviously knew the size that was right. This was more than enough to fill us up. Zoë had the pork and mushroom Chinese steamed buns (Bao), actually she had 3 of them! I tried a bite just before she scarfed them down (hence no picture… she ate them too fast!) and the pork was tender and sweet and the bun was steamed to perfection, soft but not sticky. At only 20 baht a piece it is worth getting a few just to try. They offer pork and mushroom, red bean, black bean, and custard. Overall, this meal was a success. We all loved our food and drinks. Not only that but we only had to pay 480 baht ($14.86 USD) for the whole meal. I love being able to order amazing food on the cheap, and Kopitiam is the best place to take advantage of that. So if you are ever in Phuket, make sure to catch at least one meal at Kopitiam by Wilai. I LOVE this place too – the iced mango tea is amazing! I will have to try that! 🙂 do you have a favorite food dish there I should try? I can’t remember the name of it but it was beef with chilli, garlic and basil (almost like a pad grapow but something must have been different…) and it was served with rice, vegetables and cabbage leaves for making little wraps. Delicious! But I don’t remember the name!! I will look at the descriptions when I go next. That sounds yummy! Such good food, if you make it down to phuket, make sure to go! Thank you! I never ate pork until I tried it in Asia. Back home it’s always dry and overlooked, I never knew it could be so moist and flavorful! Funny you say that, America was the place where I learnt how to cook and love pork! That is funny! Maybe I was going to the wrong places (pork chops with applesauce were served often and the chops always were sooo dry). I would order salsa wantons every time as well. And I would talk about them and I wouldn’t care who judged me as boring. Honestly, who thought to add salsa to wantons? How do people even get these ideas? It’s awesome. And yes, salsa and wontons I think are my new addiction (as if I needed one haha). Oh no! For good or just until you are better? I will be keeping my fingers crossed for you too. It really is every time auntie! Miss you! You are so lucky! Great sounding/looking food! I’ve never tried pork belly but we’ve got a restaurant scoped out in Charleston, SC to try which has pork belly on the menu! Can’t remember when your trip is–but thinking of you and its success! I can’t wait to hear what you think of pork belly. When are you headed to SC? I hope you guys have a great time! We leave in 6 days! Thank you for the kind thoughts! I am thinking that the weather in SC will be much nicer than SD. Hope spring is on its way for you. Oh boy, your food posts should come with a warning to only read on a full stomach! Your descriptions of the food make it all so easy to imagine. Pork belly is also one of my favourite cuts of meat. Not only because it’s delicious, but because it’s easy to prepare. I’ve made a dish that sounds very similar to the one you described and it was so easy, the waiting was the hardest part because you have to let it stew on the stove for at least a couple of hours! Lovely! Lovely!! Lovely!!! I so can’t wait to come over to Thailand and to have such yummies as Phuket salsa in wontons and paying nothing money for delcious meals. I only hope that my suit will fit me when I return.